The dollar managed to beat the euro and the yen, but stayed behind the mighty pound and the recovering loonie. Will these trends continue? The FOMC Meeting Minutes, Australian, Canadian employment figures and the rate decision in the UK are the main market movers on FX calendar. Here is an outlook on the top events this week. JOLTS Job Openings: Tuesday, 14:00. This lagging measure of US employment is closely watched by the Fed, which looks at a wider array of job figures and not only the unemployment rate. Job openings jumped to 4.45 million in April and are now expected to advance to 4.53 million. FOMC Meeting Minutes: Wednesday, 18:00. In the June meeting, the Fed tapered for the fifth time as expected, and also lowered growth forecasts. In the accompanying press conference, Yellen maintained a dovish tone, weighing on the dollar. Given similar moves in the past, can the meeting minutes reveal a slightly more hawkish Fed than the initial message suggested? Australian employment data: Thursday, 1:30. Australia’s unemployment rate remained unchanged at 5.8% in May, despite an unexpected drop of 5.9% in the number of jobs. Analysts expected a rise of 10,000 positions as well as a climb to 5.9% in Jobless claims. However, not all was bad, the number of full time positions increased by 22,200 while part time positions declines by 27,000. The unemployment rate increased to a decade-high 6.0% in January, while analysts and the Treasury expecting it to edge higher this year during the transition away from mining-led growth. Australia’s job market is expected to increase by 12,300 while the unemployment rate is expected to stand at 5.9%. UK rate decision: Thursday, 11:00. There was a general belief that the BOE’s would not increase interest rates until after the General Election in May 2015. However recent market data suggests the central bank may raise rates to 3% much sooner. Mark Carney originally bonded between the UK unemployment rate and BOE base rate, saying he will raise rates of unemployment drops below 7%. This goal has been unexpectedly reached forcing Carney to change the rate hike trigger to18 economic indicators. Most analysts expect a gradual rise in rates which will continue until 2017 with a first rise to 0.75% within the fourth quarter of this year.No chnge in rates is expcted this time. US Unemployment Claims: Thursday, 12:30. Initial applications for jobless benefits inched higher by 2,000 last week to a seasonally adjusted 315,000, staying near pre-recession levels. The reading was broadly in line with market forecast. the four-week moving average of continuing claims dropped to 2,580,250, declining by 6,000 from the prior week’s revised level of 2,586,250. US jobless claims are expected to reach 316,000 this time. Canadian employment data: Friday, 12:30. Canada’s unemployment rate unexpectedly climbed to 7% in May from 6.9% in the previous month amid job addition of 25,800. The main gain was part time positions, while full employment dropped 29,100. The readings were broadly in line with market forecast. The bank of Canada stated that rising global demand and a lower Canadian dollar will boost Canadian economic growth. Canadian labor market is expected to add 26,200 jobs, while the unemployment rate is predicted to remain unchanged at 7%. A sharply better-than-expected US Nonfarm Payrolls report helped push the Dollar positive for the first time in the past six weeks. Yet a virtually empty US economic calendar leaves little hope of big moves in the week ahead. And indeed, 1-week Euro/US Dollar volatility expectations finished at record lows following the Nonfarm Payrolls report. Clearly most are betting on/hedging against extremely slow moves ahead, but why didn’t NFPs change that? The US labor market data was about as strong as anyone could have hoped for, and strong employment growth should force the US Federal Reserve to tighten monetary policy more quickly than expected. Yet there needs to be more for markets to start pricing in Fed rate hikes. The US 2-year Treasury Yield—a great proxy for medium-term interest rate expectations—spiked on the NFPs report only to fall short at the 09/2013 high and likely stick to its long-standing trading range. Where might we see bigger currency volatility? Follow the interest rates. 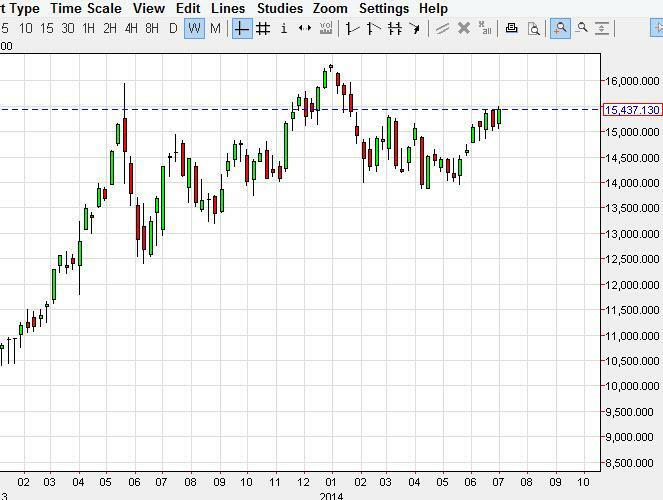 The British Pound is an obvious candidate as it trades at post-financial crisis highs, and it should be little surprise to note that UK government bond yields trade at fresh multi-year peaks. The Euro should arguably be more sensitive to the fact that the European Central Bank has cut benchmark deposit rates into negative territory. Yet Euro Zone yields were already trading near zero percent even before recent ECB actions. Interest rate expectations remain muted in the US, Euro Zone, and across G10 currencies. Thus if you can’t beat them, join them. It might be frustrating to trade in such low-volatility market conditions, but our real client data actually shows that most tend to do well in tight ranges. There’s little sense in trading for big currency swings if market conditions remain as they are, and the fact that the US Dollar remains oversold against key counterparts and that in itself leaves us focused on USD gains in the week and month ahead. - The Euro and Swiss Franc were under more intense pressure versus the British Pound, hitting new yearly lows. - EURUSD was vulnerable going into Thursday and a breakdown may have just started after the strong US NFPs. The Euro experienced a minor setback this week against most of its major counterparts, losing the most ground to the increasingly resilient and impressive British Pound. Even EURUSD had a late-week letdown on the back of the US labor market showing additional fortitude, as the US unemployment rate fell to a post-recession low of 6.1%, the lowest since September 2008. The recent barrage of important data on both sides of the pond suggests a widening differential in central bank policy, leaving the Euro at a disadvantage against the British Pound and the US Dollar going forward. As traders were buying US Dollars on Thursday after the June US labor market showed the fifth consecutive month of jobs growth above +200K, European Central Bank President Mario Draghi was simultaneously holding court after the ECB policy meeting; the Governing Council’s latest actions did little to help support the Euro. In absence of new policy action, ECB President Draghi’s greatest contribution on Thursday was to remind traders that not only would interest rates remain low for an extended period of time, but that the ECB was also intensifying prep work related to asset-backed securities (ABS) purchases. The problem for the ECB with ABS purchases, which is why the market hasn’t taken the threat as a significant reason to drive Euro exchange rates lower, is that the ABS market in the Euro-Zone is not nearly as developed as it is in the United States; and therefore the amount of ABS purchases potentially necessary is difficult to quantify. The ECB, up until this point, was not (and still truly isn’t) necessarily aware of how big the ABS market was and how strong of a purchase program they would need to design. While the threat of a major LSAP is certainly brewing, the clout behind the ECB’s potential €1 trillion TLTRO is rather weak, at least from the perspective that it could keep downside pressure on the EUR-crosses in a meaningful way. Simply put, these are not carte blanche liquidity injections; the rules published by the ECB on Thursday make well-clear their intention to improve liquidity channels and reduce credit fragmentation across the Euro-Zone. If the TLTROs are effective, they end result will be capital used to boost organic growth opportunities rather than speculative reach for yield (in the US, the UK, and the Euro-Zone, open-ended QE is widely perceived as free money for financial institutions at the expense of taxpayers and savers, so the ECB is being careful to craft a program that won’t fan the speculative flames). Over time, the TLTROs could even prove to be broadly EUR-positive, but not for several months or years. For now, the Euro is stuck with a central bank in holding position, preparing for its next move, as it waits and observes what its prior actions have resulted in. One thing is clear, however: the ECB is taking on a more dovish stance by expanding its non-standard policy easing toolbox, and has no intention of tightening policy within the next 12- to 18-months. The ECB’s ‘lower for longer’ stance is prohibitive for the Euro because the British Pound and the US Dollar are being bombarded with strong economic data and rising sovereign yields as a result, as market participants start to price in interest rate hikes from the Bank of England and the Federal Reserve, respectively. In this interim period of ECB inaction, we turn our attention outwardly to the BoE and the Fed as the more significant drivers of price action in EURGBP and EURUSD (and GBPCHF and USDCHF as well, given the highly significant, nearly perfect positive correlation between EUR and CHF since September 2011 when the SNB levied the Sf1.2000 floor in EURCHF). Last edited by 1Finance; 07-05-2014 at 09:44 AM. The GBP/USD extended the advance from June, with the pair climbing to a fresh yearly high of 1.7175, and the bullish sentiment surrounding the British Pound should gather pace throughout the second-half of 2014 as the Bank of England (BoE) looks to normalize monetary policy sooner rather than later. With the economic docket expected to show a further pickup in U.K. outputs, the British Pound may catch a bid ahead of the BoE interest rate decision on July 10, but we may see the central bank refrain from releasing a policy statement once again as the Monetary Policy Committee (MPC) is widely expected to keep the benchmark interest rate at 0.50% while maintaining its asset-purchase target at GBP 375B. Nevertheless, it seems as though we may see a greater dissent at the July meeting as BoE Chief Economist Andrew Haldane sees the U.K. growing ‘3% plus,’ while Deputy Governor Jon Cunliffe continues to highlight the threat of rising home prices, and we may see a more material shift in the policy outlook as the economic recovery gathers pace. At the same time, negative deposit rates in the Euro-Zone may further heighten the appeal of the sterling as we remain in a yield-seeking environment, and we will continue to look for a further decline in the EUR/GBP as well as the European Central Bank (ECB) pushes into uncharted territory. With that said, the GBP/USD may make a more meaningful run at the psychologically important 1.7200 handle should we see another batch of positive developments coming out of the U.K., and we will retain our approach of looking for opportunities to ‘buy dips’ in the British Pound amid the growing deviation in the policy outlook. After hitting a fresh 2014 high during Tuesday’s session and briefly probing above the 95 US cent handle, the Australian Dollar ended the week as the worst performer against its US counterpart. While a dismal set of trade balance figures took the wind out of the currency’s sails, the real blows came from a fresh round of AUD jawboning by RBA Governor Glenn Stevens and a bumper set of US Non-Farm Payrolls data. 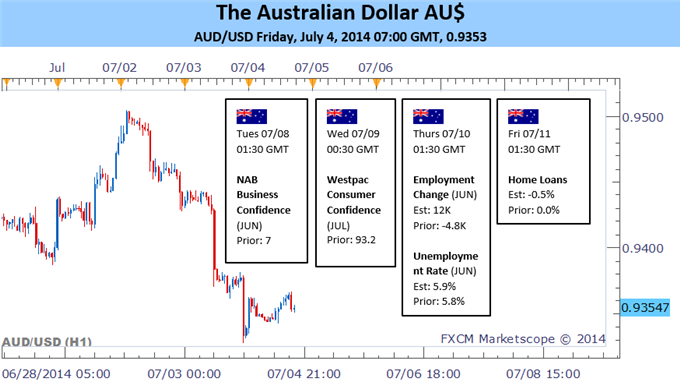 The sharp decline on Thursdays was the largest pip value fall for the AUD/USD this year. June employment figures headline the docket for local data over the week ahead with economists tipping a tick higher in the unemployment rate to 5.9 percent. An upside surprise to the jobs added figure or unanticipated decline in the headline unemployment rate could yield a spike higher for the Aussie. However, follow-through may prove limited, given the Reserve Bank of Australia is unlikely to shift their policy preference until more consistent signs of progress in the labor market are witnessed. Local Consumer and Business Confidence figures as well as Housing Finance data round out the noteworthy economic data on tap for the week. While consumer sentiment has sagged over the first half of the year, business confidence has shown some surprising resilience. On balance the leading indicators paint a patchy picture of the health of the Australian economy, which reinforce the notion that the cash rate is set to remain on hold over the near-term. One of the important themes that continues to offer the high-yielding currencies their bearings is the persistent low volatility environment, which has raised the appeal of the carry trade. Implied volatility in the FX market (measured by CVIX) hit a fresh low this week, suggesting traders are pricing in a low probability of a major economic disruption occurring in the near-term, which may continue to lure traders to the Aussie. However, as investors have continued to pile into the long Aussie trade over the past several months, the currency’s yield advantage over its US counterpart has weakened considerably. The Australian 10 year bond spread narrowed to its lowest since October 2006 on Friday (see chart below). This makes the carry trade a relatively less attractive proposition, which may in turn reduce investor’s appetite for the Aussie. Last edited by 1Finance; 07-05-2014 at 10:02 AM. The Nikkei initially fell during the course of the week, but found enough support down nearly ¥10,000 level to turn things back around. A break above the ¥10,250 level would be more than enough to start buying now, and we think that ultimately this market will go higher. However, it’s going to be a choppy matter between here and the recent highs, so anybody who is looking to take a long position in the marketplace have to be fairly confident and be able to put up with the volatility that should be coming. 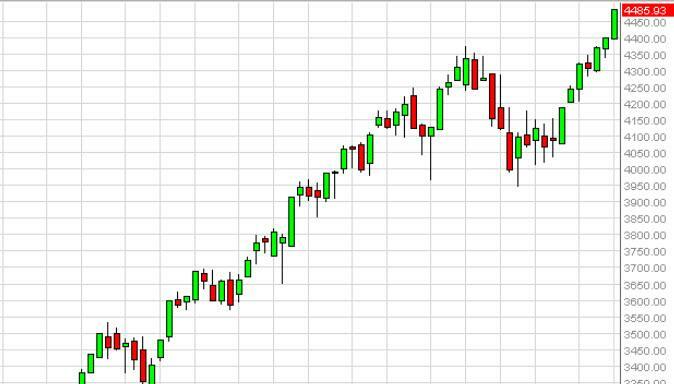 The DAX as you can see had a positive week over the last five sessions, but remains just below the recent highs. We did in fact close above the €10,000 level though, so we believe that the momentum is certainly with the buyers at this point in time. 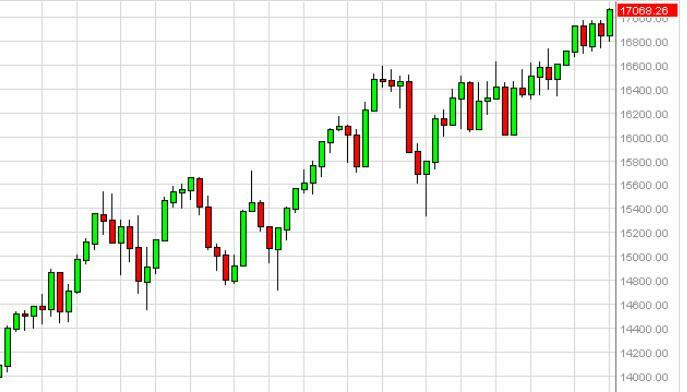 On a break of the recent highs from a couple of weeks ago, we believe that this market and then in fact runs to the €12,000 level first. After that, we believe that the market will go much higher. Pullbacks should be looked at as buying opportunities. The NASDAQ was closed on Friday, but spent the rest of the week shooting straight up from the 4400 level. We did not break above the 4500 level however, so that has to be addressed. Nonetheless, we do believe that it will ultimately get broken to the upside, but recognize that we need to see at least a daily close above that level. With this, we feel that the market cannot be sold, but anytime that it pulls back should be considered to be value, and looked at as a buying opportunity. 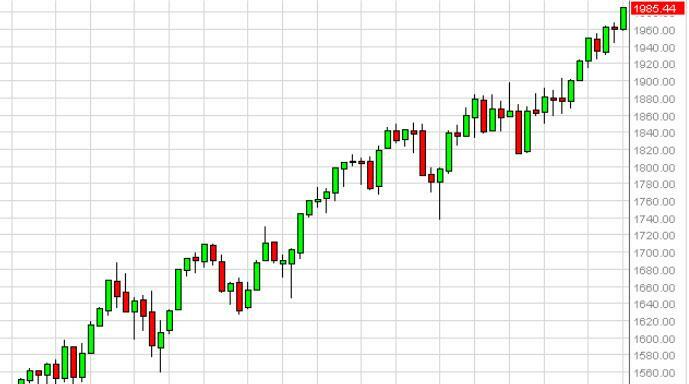 The S&P 500 rose during the course of the week, even though we only had four sessions to work with. We close at the very high as of the week, and we believe that this market is in fact going to continue to go higher. However, we recognize that the 2000 level is just a bit above year, and could in fact be resistance based upon the large round number. However, we certainly see no reason to sell this market, so we are buying supportive candles, or a close above the 2000 handle which would signal that the next leg higher is about to begin. 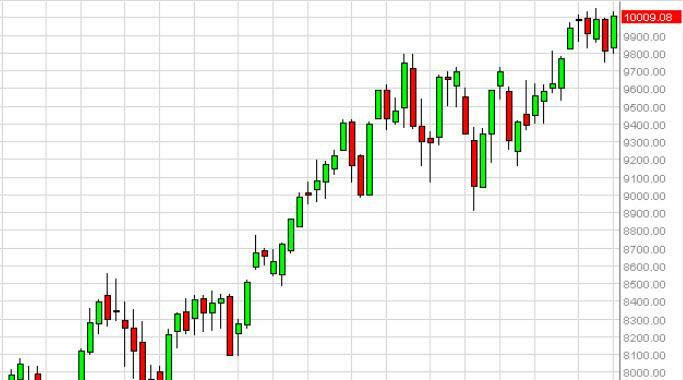 The Dow Jones 30 had a strong showing during the holiday shortened week, as Friday was Independence Day in the United States. That being the case, looking at the market we can see that there was certainly enough pressure from the buyers to make a case that we are heading into another leg up. The fact that we cleared the 17,000 level courses very bullish, and we believe that the market is going to try to reach the 20,000 level over the longer term. We are buyers on dips, and quite frankly we just be buying here as well.